An infrared and multi-wavelength image of the Central Molecular Zone in the Milky Way. Dense gas is shown in red, and warm and cold dust in green and blue, respectively. 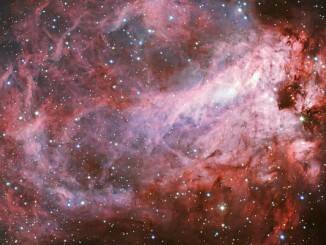 Several key objects in the region are labelled, along with a set of embedded young stellar clusters seen at 24 microns. 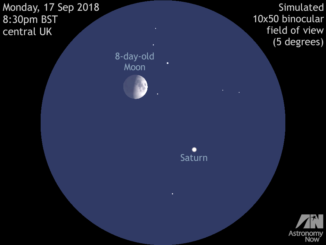 Image credit: C. Battersby. The centre of our Milky Way galaxy lies about 27,000 light-years away in the direction of the constellation of Sagittarius. At its core is a black hole about four million solar masses in size. Around the black hole is a doughnut-shaped structure about eight light-years across that rings the inner volume of neutral gas and thousands of individual stars. Around that, stretching out to about 700 light-years, is a dense zone of activity called the Central Molecular Zone (CMZ). It contains almost eighty percent of all the dense gas in the galaxy — a reservoir of tens of millions of solar masses of material — and hosts giant molecular clouds and massive star forming clusters of luminous stars, among other regions many of which are poorly understood. For example, the CMZ contains many dense molecular clouds that would normally be expected to produce new stars, but which are instead eerily desolate. It also contains gas moving at highly supersonic velocities — hundreds of kilometres per second (hundreds of thousands of miles per hour). CfA astronomers Cara Battersby, Dan Walker, and Qizhou Zhang, with their team of colleagues, used the Australian Mopra radio telescope to study the three molecules HNCO, N2H+, and HNC in the CMZ. These particular molecules were selected because they do a good job of tracing the wide range of conditions thought to be present in the CMZ, from shocked gas to quiescent material, and also because they suffer only minimally from cluttering and extinction effects that complicate more abundant species like carbon monoxide. The scientists developed a new computer code to analyse efficiently the large amounts of data they had. The astronomers find, consistent with previous results, that the CMZ is not centred on the black hole, but (for reasons that are not understood) is offset; they also confirm that the gas motions throughout are supersonic. They identify two large-scale flows across the region, and suggest they represent one coherent (or at most two independent) streams of material, perhaps even spiral-like arms. They also analyse the gas in several previously identified zones of the CMZ, finding that one shell-like region thought to be the result of supernova explosions may instead be several regions that are physically unrelated, and that a giant cloud thought to be independent is actually an extension of the large-scale flows. The scientists note that this work is a first step in unravelling an intrinsically complex galactic environment, and that pending research will trace the gas motions to larger distances and try to model the CMZ gas motions with computer simulations. This colourful and star-studded view of the Milky Way galaxy was captured when the NASA/ESA Hubble Space Telescope pointed its cameras towards the constellation of Sagittarius. 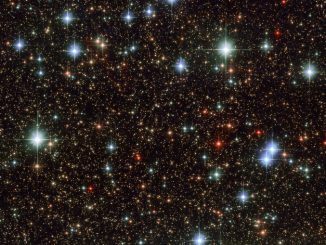 Blue stars can be seen scattered across the frame, set against a distant backdrop of red-hued cosmic companions. This blue litter most likely formed at the same time from the same collapsing molecular cloud.